Mexico is opening a new consulate in St. Paul next month. The office will serve the thousands of Mexicans living in Minnesota, the Dakotas and northern Wisconsin. But Mexicans aren't the only ones celebrating. St. Paul, Minn. — Antonio Hernandez is a Mexican citizen. For years, he worked as a butcher. Then the economy in his region collapsed. Like many other men in his community, he came to the states two years ago because he needed to support his family. "We came here in search of those greenbacks," says Hernandez. He's still cutting meat, now at a little Mexican market in Richfield, a suburb south of Minneapolis. As he wrestles a side of beef on a shakey cart, he slices the meat extra thin for Mexican barbecue. It's a cut you don't typically find in a grocery store, which makes this shop a necessity among Mexicanos. Like many towns around the state , Richfield's Latino community grew significantly in the last decade, and many of the newcomers are from Mexico. That's why Mexico is opening a consulate in St. Paul next month. Nathan Wolf is setting it up. Although Wolf has been in the Mexican foreign service for 13 years -- he started when he was only 23 -- this is the first consulate he will build from the ground up. Before coming here, he was a diplomatic advisor to Mexican President Vicente Fox. Although he's still getting to know the community here, he already knows what they want. It's a document called a matricula consular, an identification card for Mexicans in the U.S. In Minnesota, the document can help people without other identification get a bank account, or even a home mortgage. It doesn't work for getting a driver's license which requires a social security card. The matricula consular helps Mexicans send money safely home to Mexico and Mexico is banking on that influx of American dollars. They now make up the largest part of Mexico's gross national product. Nathan Wolf says the consulate will provide another important service. His office will help Mexican nationals when they get in trouble with the law. "Our commitment is to assure that that person is going to have access to all his legal rights," Wolf says. "That that person has access to a translator and a lawyer who may be bilingual. (But) We're not going to get involved in the law of the country or the law of the state." According to the Vienna Convention for Consular Affairs, law enforcement officials are supposed to tell foreign nationals they have the right to talk to someone at the closest consulate. Wolf and his staff will tour the state to inform authorities about the requirement. Richfield's Chief of police Dan Scott said he had no idea his department was obligated to let suspects call the consulate. He says the hardest part about the influx of Latinos to the area is the language barrier. He has a few Spanish-speaking officers, but if they're not available his department uses a phone-service to translate. He hopes the consulate might be able to help identify some of the people he arrests who don’t have any identification. "If we can't identify them they'll be booked into jail as John Doe or something," he says. "That's why I think having a consulate here would be a real benefit." Chief Scott isn't the only one who wants help from the consulate. So do Minnesotans wanting to do business with Mexico. Gabriel Castaneda is trying to set up a Mexico-Minnesota trade commission. The non-profit board would help Minnesotan businesses market their products in Mexico or find manufacturing partners there. "While I don't think trade is a core objective of the consulate," he says. "I think the fact that the consulate is here will make trade easier." Wolf says he will help businesses connect. 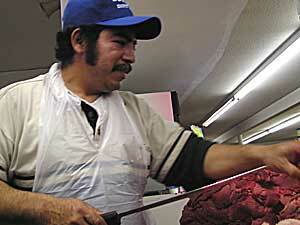 But he's most interested in people like Antonio Hernandez, the butcher working in Richfield. In June, Hernandez will likely show up at the new Mexican consulate and get his matricula consular.